As with many other segments of society, too many small business owners spend too much of their time watching television. The best information for locating small business financing is definitely not to be found in creative TV commercials, clever radio spots, or glossy magazine ads. If the truth be known, the lenders with the fanciest and most expensive advertising may, in fact, be the most difficult sources from which to obtain a loan. Why do the largest banks spend so much money on advertising when they already have a high public profile and branches on every other corner? One likely reason is that, in comparison to their smaller competitors, these larger banks have more stringent credit standards and therefore turn down a higher percentage of loan applications. Consequently, they need a larger stream of applications in order to find a sufficient amount of loan requests to approve. So, how can a borrower find a lender who's truly interested in small businesses? Borrowers need to research the market for lenders that address the problems and needs of the small business sector. One of the best places to begin this research is at the nearest Small Business Administration (SBA) District Office. The SBA can provide information about local lenders who participate in the SBA loan guaranty program. They can also disclose the total dollar amount of loans made by any specific lender in that district in preceding financial periods. By evaluating this along with other public information, the borrower can get a reasonable idea of how important SBA lending is to a prospective lender. All state- and federally regulated banks are required to make copies of their financial statements available to the public. Comparing a bank's total commercial loan volume with its total SBA loan volume gives an indication of how significant SBA lending is to the bank's commercial loan portfolio. Another important factor is the bank's size in relation to its SBA portfolio. For instance, if a $1 billion bank writes only $8 million in SBA loans, and a $50 million bank makes $12 million in SBA loans, it's quite apparent which lender has the stronger interest in the small business market. The borrower should interview commercial loan officers from several local lenders to determine if they make small business loans, as well as their overall level of interest in them. The borrower must attempt to determine which lender would be most likely to favorably consider the specific type of transaction that's needed. 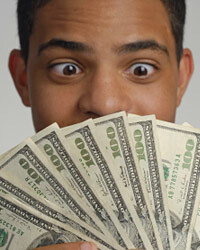 The borrower should also keep in mind that some lenders may not be in optimal financial condition. Like other businesses, banks perform inadequately and even fail, for a variety of reasons. However, bank financial problems generally don't just happen overnight. For this reason the bank's financial statement can again be of great use, since the institution's performance is a matter of public record. There are many other sources of information about a potential lender that the borrower can utilize, such as the borrower's CPA or tax advisor, other business owners, even business competitors. Virtually every small business needs financing at some time or another. Establishing a prospective list of lenders early in the process can, in the long run, be well worth the time and effort.